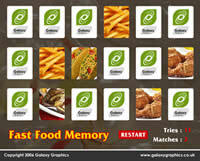 Fast Food Memory card game by Galaxy Graphics. A customizable web game for licence and customization. The games shown above are only a selection of the 50+ brandable Flash games available from Galaxy Graphics. The traditional card game works just as well online, where the player turns over two cards at a time and tries to match all the pairs in the least number of tries possible. Whilst this example web game deals with fast food such as burgers, fries, pizza and cola, it could just as easily be customised with your own products/service, together with your company logo on the backs of the cards. Why not provide this entertaining diversion on your site? - taking advantage of the opportunity to reinforce your products/services and brand/logo, whilst keeping users on your site a while longer.